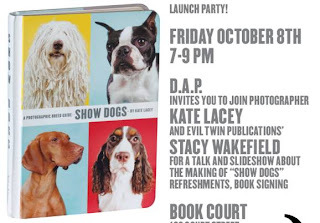 On Friday, October 8th, from 7:00 to 9:00 p.m., Book Court in Brooklyn will host a release party for Show Dogs: A Photographic Breed Guide by Kate Lacey, which features Leo’s by the Sea Furion as well as other AKC show dogs. The book is a collection of funny, sweet, and compelling dog portraits on candy-colored backgrounds. Each of the American Kennel Club Dog Breeds--Terriers, Hounds, Sporting, Working Dogs, and more--is represented by a unique individual dog with a personality all its own. 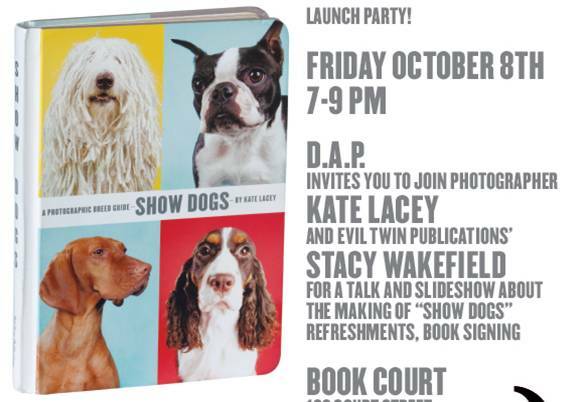 Kate Lacey, a freelance photographer in New York, started photographing show dogs in 2005 when Life assigned her to cover the Westminster show. Instead of shooting documentary style, she decided to rig up backdrops and made classic portraits of dozens of dogs. Kate and Furion will be at the Book Court Store to sign and paw print your books personally.